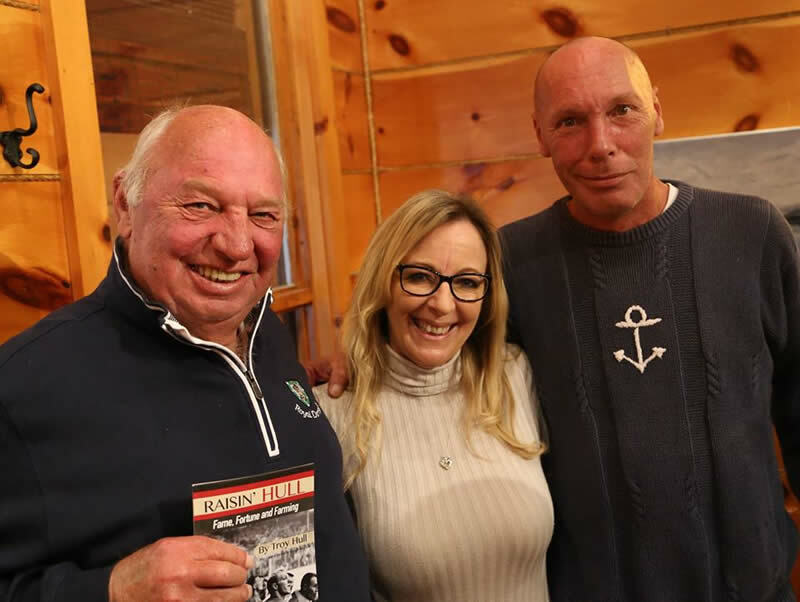 Troy Hull, far right, with his uncle Dennis Hull and friend Kelly Leigh Martin, at the book launch for Raisin’ Hull. His uncle Bobby Hull and cousin Brett Hull are two of the greatest goalscorers in NHL history, but it was his other hockey-playing uncle, Dennis Hull, who had the most influence on Troy Hull's recently-released book, Raisin’ Hull - Fame, Fortune and Farming. Though Troy didn't know it at the time, getting to read a version of Uncle Dennis' rollicking, hilarious book, The Third Best Hull: I Would Have Been Fourth But They Wouldn't Let My Sister Maxine Play, set the wheels in motion for his own work. That book, written by Dennis and co-author Robert Thompson, initially came out in 1998 and was reprinted in 2015. “I found the way he wrote to have influenced me as to how I like to write, as if I am actually speaking in front of you,” recalled Troy Hull. “When I read the final draft it kind of inspired me to keep notes.” Some of those notes were his own interactions with Uncle Dennis, a much sought-after speaker at hockey engagements. The collection of short stories that make up Raisin’ Hull came about almost unintentionally. “I never had any plans to become a writer, this all became possible when my folks were about to celebrate their 50th anniversary and my older sister Tracy asked me to write the speech for the big day. I sat down one evening with a glass of wine and out poured a great speech,” recalled Troy. The result was moving, with his sister, then two nieces, weeping while reading it. Troy was encouraged to keep writing, and the first result was the short story, “The Night Chicago Stadium Fell Silent,” which was published by a number of small sports magazines in Ontario. He further considered a bigger project about the Hull family. Troy's father is Garry Hull, one of 11 children to Robert and Lena Hull in Pointe Anne, Ontario. “The Golden Jet” Bobby Hull is the oldest of the siblings. With such a big clan, there were plenty of stories, whether it was from the rink, the farm or the home. 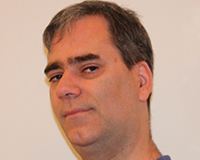 “You don't have to be a hockey fan in order to enjoy my stories; not everything in my life evolved around hockey,” said Troy, who was running a renovation company in Durham Region, outside Toronto, when he got the writing bug. Alas, the bug often bit in the wee hours, and he'd find himself wide awake at 3 a.m. with a tale to tell. Raisin’ Hull is a self-published project, and Troy will admit there were some hiccups on the way to the printer. “Like anyone starting a new venture it is quite rare that things go smoothly 100% of the time,” he said. The reception so far for Raisin’ Hull has been overwhelming, said Troy. 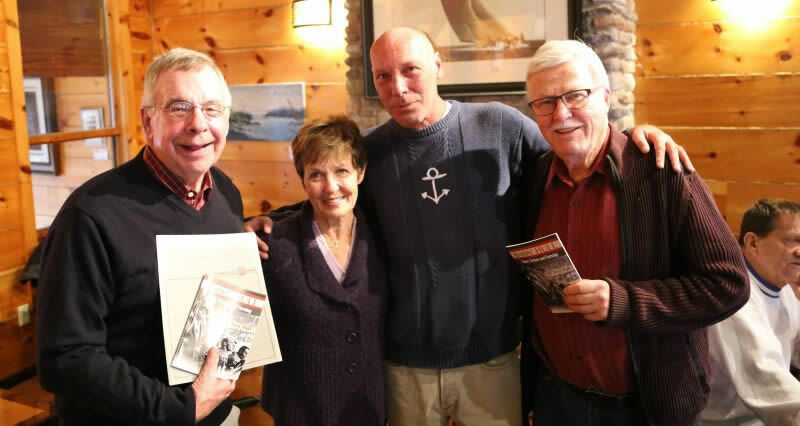 The initial book launch, in late October 2017 at his friend's restaurant, The Boat House in Belleville, Ont., quickly became a bigger event than anyone anticipated, with close to 250 people turning up, including Dennis Hull and his long-time pal, Brian McFarlane. “We noticed that several people who came out stayed for the entire four hours, it was overwhelming. My entire family were there and the entire day was a huge success and further encouraged me to continue writing,” said Troy. He sees that as a positive sign. Troy Hull with Will Pringle, and Joan and Brian McFarlane. In 2015, Las Vegas native Kirk McKnight saw his first book published, The Voices of Baseball: The Game's Greatest Broadcasters Reflect on America's Pastime. What to do for a follow-up? The idea came to him during the process. So into the world of hockey journalism comes The Voices of Hockey: Broadcasters Reflect on the Fastest Game on Earth. The books are similar, with broadcasters from each team helping go through the history of the franchise, but the uniqueness of baseball stadiums meant that the narrative often went in that direction; with hockey, the days of smaller, intimate arenas, like the Boston Garden, are long gone. The book explores what it's like to cover hockey, the arenas, and features a celebration of some of the greatest names behind the microphone in hockey history. There are 10 different names already in the Hockey Hall of Fame in the broadcasting wing who are interviewed. The broadcasters tell some really unique stories, given their perch atop the arena, viewing the action differently than most fans. Interplay with fans comes up often, and everyone has a story about a great brawl or a great goal. McKnight's backdrop of Las Vegas is not your traditional hockey market, even now with the arrival of the Golden Knights. He can remember hockey appearing on his radar when he was about 10 years old, and Wayne Gretzky was traded to the L.A. Kings. That resulted in watching hockey when he could, with Mario Lemieux's Penguins his favourite team, even if they were difficult to find on TV to watch. The IHL's Las Vegas Thunder helped grow his passion for the game. The hope is that The Voices of Hockey finds a home on both sides of the border. “My target audience was definitely not intended to be just American readers. I did my interviews on a team by team basis, so with 24 teams from the states and seven from Canada, it's going to probably skew more to the States as far as pop culture, geography, and maybe even broadcasters themselves. In my defence, the broadcasters did mention Hockey Night in Canada a great deal because so many of them grew up in Canada.” He's mulling similar books on college basketball or football. To conclude, McKnight points out that this isn't a broadcasting textbook by any means. 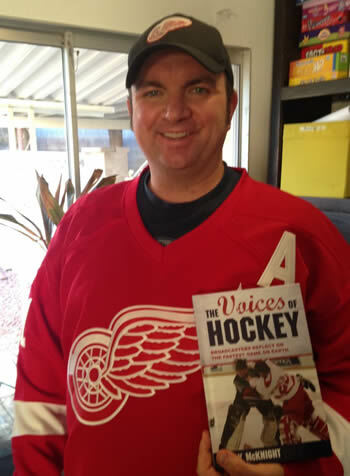 “My aim in this book was to cater to the fans of hockey and not so much the fans and enthusiasts of broadcasting. I've always wanted to use the broadcaster's perspective because who knows more than them? Marv Albert's epigraph is a great encapsulation of TV versus radio as far as broadcasting is concerned. Perhaps The Voices of Baseball discusses more the craft of broadcasting because baseball is a sport of significant downtime. Hockey is all about the action, which is what I wished to put into the book more than anything else. I listen to a lot of Vegas Golden Knights radio and TV broadcasting courtesy of Dan D'Uva and Dave Goucher. In fact, I was fortunate enough to speak with Goucher while he was doing radio with the Bruins. Having those two gentlemen call your team, which is currently 29-10-2 and in 1st place, is a true representation of having your cake and eating it, too." Thanks for the support of this column so far. It's a daunting task looking ahead at a full year of columns, since so many books come out on hockey, and many of them all at once in the fall. My hope is to both showcase recently-printed books, but also a few from the past as well. Any ideas or suggestions?